This is a limited edition, signed giclee print. This is a giclee print of an original oil painting which has been colour matched and checked by the artist and signed. It comes with a signed certificate of authenticity. It is a limited edition of 150 prints. The paper is Hahnemuhle German etching paper 310gsm. 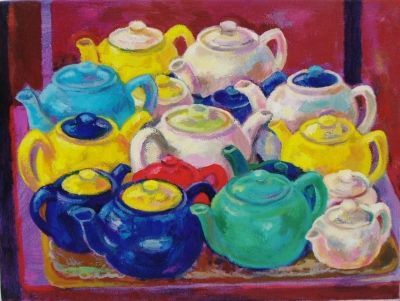 This painting was inspired by a group of teapots that were sitting on a trolley in a cafe kitchen. I noticed them every Saturday when I went to this particular cafe and the idea grew for a painting. They seemed to be waiting for something to happen! They also reminded me of people. Postage is £3.99. The print will be sent in an envelope especially made for this type of print. I can be contacted through this website.